Picture this, you arrive on the grounds of the Ohio State Reformatory, also known as the Mansfield Reformatory. Upon entering the doorway it suddenly hits you that you are about to walk the same halls as history's most infamous prisoners. Once used during the Civil War by prisoners as a training camp for soldiers, location for the filming of Shawshank Redemption and rumored to be haunted you undoubtedly sense a powerful force drift through the passageways of this massive building that holds a tremendous amount of history. Is it the past energy that radiates through the halls of this haunted establishment? Maybe. Or is it the fact that some of the heaviest names in rock music are about to rock your face off?! We are talking about Inkcarceration this JULY 13, 14, 15 2018 and it's all going down in Mansfield OH. 3 days, 2 stages, 30+ bands, 70+ tattoo artists, food, drinks, a haunted reformatory and camping. Now THIS is a festival if I have ever heard of one. 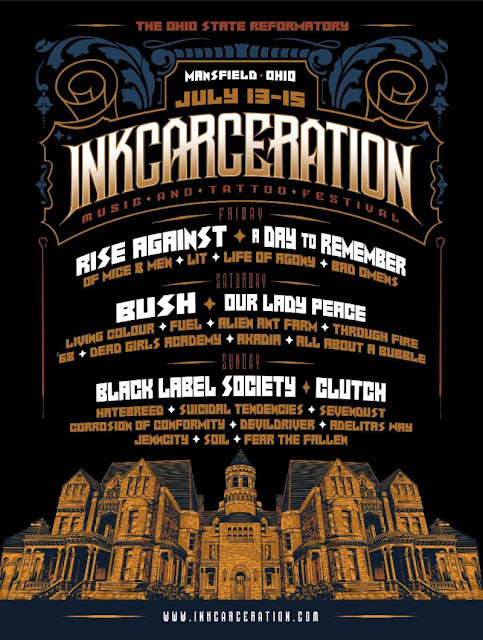 Inkcarceration is a complete mash up of everything we love. Local and regional tattoo artists will be tattooing all weekend inside the reformatory while taking part in competitions. Mistress Juliya will be hosting the wild event as well as taking part in judging the tattoo competition. I mean come on! If there is a festival you have to check out this summer Inkcarceration is it. So go ahead and call your friends, grab your tickets and find anything and everything that you need to know about Inkcarceration right here.